Most people with Blue Cross NC health insurance also have a drug plan to cover the drugs they get at their pharmacy. Each drug plan comes with a list (also known as a formulary) that shows you what drugs are covered. Are your prescription drugs covered? 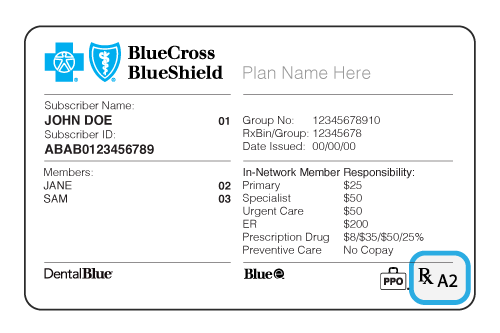 1) Look for the "Rx" on the front of your Blue Cross NC member ID card. It means you have drug coverage. 2) Look for a capital letter or a capital letter/number combination after the "Rx" on your card. The letter will tell you which drug list, or formulary, your plan uses. The number gives information about the pharmacies in your network. Already logged in? Skip to step 2. Type a drug name in the blue search box and Submit. The drug name, description and cost info will appear under "Selected medicines." If you need prior authorization or have other special requirements, that may be listed here also. What is Prior Authorization? This means your doctor must explain in writing why you need a certain medication before Blue Cross NC can decide if it will be covered. Our drug search tool shows the restricted drugs our members use most, and the details your doctor or provider must send us to get them approved. Enter your drug name in the search box to see if it needs approval before it's covered under your plan. To find a drug, use the search above or select a letter from the list above. Your doctor must explain in writing why you need a certain medication before Blue Cross NC can decide if it will be covered. To encourage the proper use of prescription drugs, Blue Cross NC may restrict the amount of medicine your insurance plan covers. This may mean taking fewer pills each day without changing the total amount of medication. If your doctor thinks the non-restricted drug is likely to be harmful to your health or not effective in treating your condition. A non-formulary drug is one that isn't on your Blue Cross NC drug list. Not all drug lists or formularies have non-formulary drugs. Doctors must confirm that you have tried a drug on your list first and that they were ineffective or harmful to you. Also, medication-specific clinical criteria must be met before approval (available in the Drug Search). Specialty drugs are limited to a 30-day supply and you must get them from an in-network specialty pharmacy, so your benefits will apply to the prescription. In-network pharmacy options vary based on your plan benefits. *See "Covered Services" and "Glossary" in your benefit booklet for to learn more. Members with Essential Drug Lists or Formularies: If you meet certain conditions, read the Criteria for Approval of Restricted Products (pdf), and your list says that Prior Review (Prior Authorization) or Step Therapy is required for a drug, but the drug isn't in the Drug Search, have your doctor send your information to Blue Cross NC using this General Authorization Fax Form (pdf). Important: If you've changed health plans, your doctor or provider may need to tell us that you've met the rules for your new plan. For Fastest Processing, have a doctor or provider submit your request directly to Blue Cross NC. If you submit the request yourself, it will take longer to process while we contact your provider to get the information needed. They have 5 calendar days to respond. Online (Preferred for Providers Only): CoverMyMeds.com Some drugs if approved can be ready at the pharmacy in less than 2 hours. Email: PharmacyCoordinator@bcbsnc.com Important! Sending health information by email comes with the risk that it could be read by people you didn't send it to. Use an encrypted email service or other secure means of communication that may protect your information from third parties. You acknowledge that you understand these risks when you send your email. Once we have all your information, we'll make a decision within 3 business days and notify your doctor. Requests are processed within 72 hours, unless urgent. Urgent requests are handled within 24 hours. An urgent request is when the prescriber thinks a delay would seriously jeopardize the life or health of the patient, the patient's ability to regain maximum function, or would subject the patient to severe pain that cannot be adequately managed without the care or treatment requested. Ask if there's another drug you could take. Check to see if the new drug is on your drug list. If you can use another drug, you're all set! If you still need the non-formulary drug, have your provider send us a request to approve the non- formulary drug. For approval, you must meet your plan's Non-Formulary Exception Criteria (pdf). If the drug is listed in the Drug Search, these requirements may still apply. Your doctor or provider must send all your details, and their signature, on the General Authorization QL Fax Form (pdf) to Blue Cross NC. For questions, or to check the status of your review, call us at 1-800-672-7897. Some drugs may not be covered by your plan or may have a limited amount you can get with your plan. The Table of Drugs with Limited or No Coverage shows a sample listing. Not all limited medications are listed. Self-funded and ASO group members should check their member guide or call Blue Cross NC Customer Service for drug limits that may apply to them. Initial fill of immediate-release opioid All: Limited to maximum of 7 days for initial fill. If this is not the first fill, but Blue Cross NC does not have the patient's claims history, use this IR Opioid QL Criteria (pdf) and IR Opioid QL Fax Form (pdf). Check the Request for Waiver of Brand Drug Fees to see if you meet our requirements. Send a Safety MedWatch Form to the FDA to tell them why you can't take the generic. Send us a Request for Waiver Faxback Form with your details.